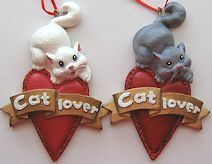 Here is a white or grey cat resting on a big red heat that says Cat Lover. The resin ornament is 4 1/4" high x 3" wide. Red ribbon loop for hanging. Choose your favorite style.